People’s foray into e-commerce that we heard about last month is now underway. 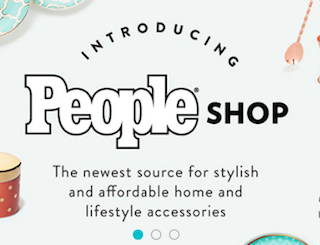 People Shop features products from 18 different brands. Initial launch brands include Live Like a Royal (Royal family-inspired products); Pet Shop (exactly what it sounds like); Under $25 (again, self-explanatory) and What We’re Loving (products reviewed by People staffers). A quick scan of People Shop unveiled the following fiends: A pink, thermal mug that says “I Tried My Best” ($14), a cosmetic bag with a pug on it ($18) and an agenda book with “I Am Very Busy” printed on it ($20).